Extract published by AJ here. A fundamental update to the RIBA Plan of Work is long overdue after many building industry changes, because it did not reflect these changes or was unable to do so in incremental refinements. In particular the integration of procurement changes, BIM and the importance of sustainable design and ‘Soft Landings’ have been absent for too long. Though some of these the RIBA tackled by recent publications of the Green overlay and BIM overlay. (And my own attempt to include sustainable design decision-making in the ‘Green RIBA Plan of Work checklists’, which also includes Soft Landings steps, in the first chapter of The Environmental Design Pocketbook.) Equally the increasing multi-disciplinary delivery of architecture and energy-efficient retrofit elements to many projects are big changes we have seen in the industry, which the consultation documents acknowledge that this needs to be addressed. Yet it is unclear what shape this will take in the new Plan of Works. Headlining Soft Landings and Post Occupancy Evaluation in Stage 7, with mention of Soft Landings in ‘Preparation’ Stage 1 is to be applauded, yet it matters at each stage of the process. 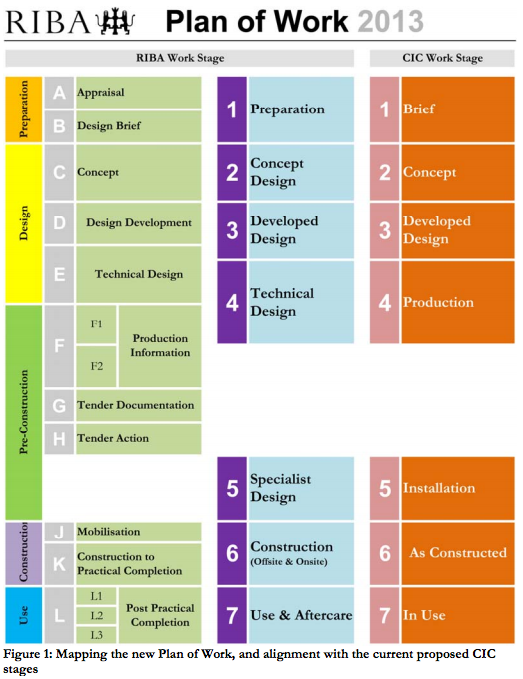 However, a lot of detail on this and on sustainable design, BIM, prefabrication and multi-disciplinary working are missing in the overview diagram (at bottom of page) for it to be truly helpful to practitioners, though one hopes that this may be provided in the form of detailed work descriptions and checklists in electronic format. Yet, without the strategic changes being headlined clearly and separately in their own right in the Plan of Works overview, true integration may remain elusive. So while the reduced and simplified work stages (as well as alignment to the CIC stages) is to be applauded, the draft diagram of the proposed stages, while giving a neat overview on one A4 sheet, misses some important headlines and detail to guide architects and clients through the process and is an unfortunate missed opportunity to truly integrate sustainable design in the design and building process. It is disappointing that no specific mention is made in proposed Work Stage 7 (‘Use & After Care’) of refurbishment and demolition/re-use of building as an integral part of the work stages and ‘cradle to cradle’ approaches, which needs to be included for at early design stages. This was already identified by Sandy Halliday in the ‘Green Guide to the Architect’s Job Book’ more than a decade ago. Mention is made of ‘sustainability assessments’, but not until Stage 3, (‘Developed Design’), when this should occur much earlier to encourage truly integrated sustainable design, rather than as a ticking boxes exercise for Planning. Energy, ecology and environment are listed in earlier stages, yet disappear beyond Stage 3, when these issues are still very much part of later stages. It is unclear how much detail and guidance the final Plan of Work will provide to be truly helpful to designers and reflect the actual work that will need to be undertaken at those stages, but it is unlikely that just listing some issues is going to do the trick alone. 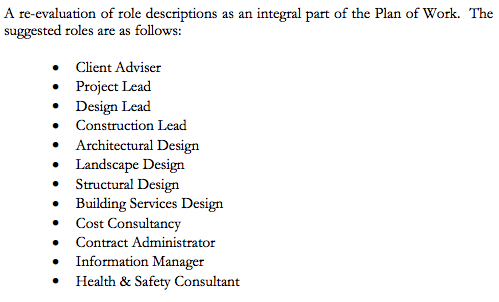 It is also disappointing to see that in the suggested role descriptions, ‘environmental or sustainability’ consultants and ecological consultants are not at all listed. Is it presumed these services are provided by ‘building services design’? If so, this is a rather flawed view of what sustainable design really entails. While many building services designers often do BREEAM/Code for Sustainable Homes accreditation; building modelling; daylighting studies; fabric/services design to meet the Building Regulations and often also renewable energy provision and sometimes also POE; it are often other consultants, who offer expertise in health; indoor air-quality, noise, water, biodiversity, land-use, waste, life-cycle analysis and embodied energy. But there is no mention of them. Whether private residential clients, public projects or contractor clients; and whether new or retrofit projects; large or small; issues encountered and Stages required will be different. An adapted Plan of Work should be applicable to each of these for ease of use. The consultation document acknowledges the different approaches, but there is no evidence yet how this will materialise in the final Plan of Works. In general, while we are used to the A-L work stages, the new Plan of Work will require a mental shift from this to overlap with the new 7 stages, but I don't think there will be much disruption to practice. Ultimately the new Plan of Works is intended as an update to reflect what many practices are already doing to some extent and professionals may find it actually supports them in achieving greater clarity with clients and streamlines team meetings and information output. However, its usefulness and success will depend on the detail provided behind the main work stage headlines. If insufficient detail is provided, then professionals are likely to keep using their own adapted Plan of Work catered for their own needs, whether they reflect the construction industry’s changing responsibilities or not. If however sufficient underlying detail is provided then the new RIBA Plan of Work could help streamline design team and client discussions with the potential outcome where clients and teams think about certain issues such as Soft Landings and sustainability much earlier on (or to consider it at all) – and this would really change how we design and build for the better. 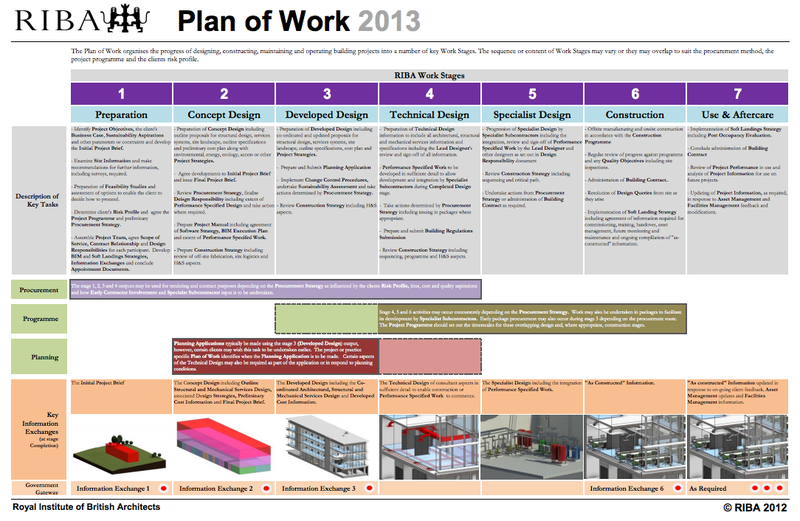 Overview of the proposed RIBA changes to the Plan of Works. Its success in the delivery of sustainable buildings will depend on the supporting information and guidance provided behind the main headlines.